« ‘Tis the season of special offers! The volcanic Auvergne region in central France is a great destination for an alternative winter holiday. Although the Auvergne is only a couple of hundred miles from the higher altitude resorts of the Alps, it’s a different world altogether. If the top end, fully-catered luxury ski chalet and the fashionable après-ski bar scene is not what you want from your Winter holiday then the Auvergne could be the destination for you. If you want to try some different Winter sports after you have exhausted the great family-friendly piste skiing, then the Auvergne is definitely the destination for you! The Auvergne region, of which Clermont-Ferrand is the capital, is one of France’s best kept winter holiday secrets. The Winter sports scene is not confined to piste skiing. Oh no. Here, you can try your hand at ‘ski de fond’ otherwise known as Nordic/cross country skiing, head into the hills on showshoes or even throw yourself down one of the especially designed luge/toboggan slopes that you will find at many resorts in the Auvergne. Or why not try your hand at dog-sledding even? 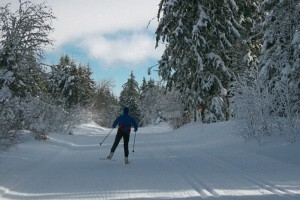 Yes, the Auvergne is a great destination for multiple winter sports! Snowshoes or ‘Raquettes’ as they are known in France are a fantastic means by which to explore the hills when the snow is more than a few inches deep. Snow shoes can be hired at any one of the ‘Espaces Nordiques’ in the Auvergne. Discover mile after mile of waymarked itineraries in the Sancy mountain range or in the Domaine Nordique des Crêtes du Forez near Ambert in the Eastern Auvergne. Head up into the mountains in complete safety and soak in the stunning views of the snow-clad mountains in all directions. It is a special experience and open to people of all fitness levels. 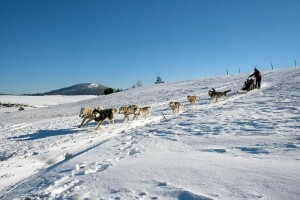 Learn how to drive your own husky team and take the dogs for an outing in the Sancy Mountains! What a unique experience. Randogs are the specialists in the area and will give you half an hour’s instruction in a warm yurt, and then you’re on your own, driving a set of baying huskies whose aim is to pull the sledge as fast as possible! However, if you would just like to be taken out in a dog sleigh then of course that is possible too. If you are not one for the adrenaline rush of downhill piste skiing, then you should give Nordic skiing or ‘ski de fond’ a try. Following waymarked circuits to suit all abilities, you follow mile after mile of beautifully groomed tracks either ‘skating’ (as in the photo) or using the ‘classic’ technique following the pre-formed tracks. The main centre for Nordic skiing in the Auvergne is the Espace Nordique de Sancy which has a wonderful 250kms of pisted tracks. Equipment can be hired if you don’t have your own. Nordic skiing can be as physical as you want to make it. You can get an intense full body workout which will appeal to the more sporty types, but it can also be a gentler activity for those seeking an easier day in the snow. The choice is yours. For a proper family activity, head to Superbesse or Mont Dore for an afternoon of sledging on especially created slopes including some specifically designed for small children. For sledgers seeking an adrenaline-fuelled ride, hire a specially designed toboggan and hit the 3km long ‘Fantasy Luge’ slope at Superbesse and experience a descent of 500m. 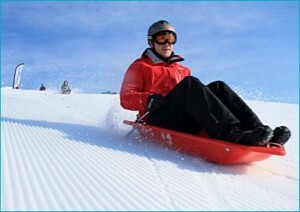 The ride is the equivalent of a red ski run, so not for those with little experience of sledging! Great fun! 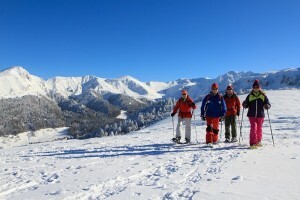 So if you are planning a winter holiday, open your eyes to the other winter sport destinations in France and challenge yourself to try a different sport for once.